Time for Mardi Gras with Buttermilk Beignets! It’s almost Mardi Gras, and we Southerners know how important that is! To celebrate a classic, Southern tradition, we give you: Buttermilk Beignets from Joy the Baker. There is nothing better in this world than fried dough with plenty of powdered sugar sprinkled on top. Happy Mardi Gras! To start, allow the whole milk and buttermilk to sit at room temperature for about 20 minutes before bringing this recipe together. Pour whole milk into a small saucepan and heat over medium heat. Heat until milk is steaming and small bubbles form on the surface. The milk will be very warm to the touch. Remove from the heat and pour warm milk into the bowl of an electric stand mixer. Add buttermilk to the warm milk. Stir in granulated sugar. Sprinkle yeast over the milk and sugar mixture. Stir gently. Allow milk and yeast mixture to sit for 5 minutes to activate the yeast. When yeast is active, the tops of the mixture will be slightly foamy and bubbling. Add flour, baking soda, and salt to the wet ingredients. Use a dough hook and beat on low speed until the dry ingredients are moistened. Increase speed to medium and beat for 5 minutes. This is a very wet dough so the dough will stick to the bottom of the bowl as it is beaten with the dough hook. Try not to be tempted to add more flour, but is you must, add up to 1/2 cup more flour (the mixture will still be wet). Stop the mixer and use a spatula to scrape the dough from the bottom of the bowl, ensuring that all of the wet and dry ingredients are thoroughly combined. Remember: the dough will be sticky. AKA: don’t freak out. Leave dough in the mixing bowl to rise. Cover with plastic wrap and a clean dish towel. Allow to rest in a warm place for 1 hour. Generously flour a work surface with bread flour. Use a spatula to remove the risen dough from the bowl. Once dough is on the floured work surface, generously flour the top of the dough. Gently flatten the dough, fold it in half, then tuck the ends under to create a dough round. The dough will still be very moist, but as long as your work surface is well-floured, you shouldn’t have any issues. Use a floured rolling pin to roll the dough into a 1/2 to 1/3-inch thick rectangle. Cover the dough with a clean dish towel and allow to rest for 5 minutes. Using a bench knife or pizza cutter, cut the dough into 1 1/2 inch squares. Stop to flour the knife or pizza cutter as you slice. Try to separate the slices as you cut them so the dough does not stick together after it is sliced. Place enough oil in a saucepan to fill it to a depth of about 3-inches. I used 32 ounces of oil in a 3qt saucepan. Place a candy thermometer in the oil and heat over medium-high head to 375 degrees F. Place several layers of paper towel on a clean work surface. Place a cooling rack (if you have one) atop the paper towels. This will be our cooling and powder sugar station. 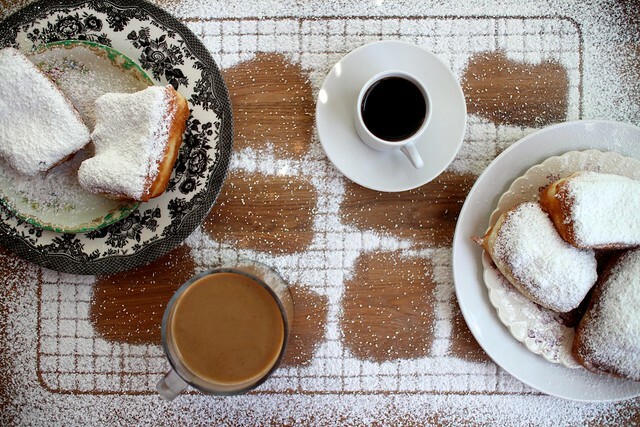 Place powdered sugar is a fine mesh sifter to dust the beignets as they come out of the oil. Gently add beignets to the hot oil. Try not to overcrowd the pan, I could fit three beignets at a time in my pan. Fry until golden brown on both sides, flipping them once or twice during frying, about 2 to 3 minutes. Remove from oil and place on cooling rack. Immediately dust with a generous amount of powdered sugar. Before frying more batches of beignets make sure the oil is at 375 degrees F. Fry until all dough is cooked through and dusted with sugar. Serve immediately. These beignets are best (as most things are) straight from the fryer. These beignets are best the day they’re made, very soon after frying. Lake Carolina Military Outreach and Fort Jackson Army Community invites you to participate in the latest “Connections Through Hobbies” Event: Scrapbooking! Happening on Tuesday, February 25th from 10 am- 12 pm at the Lake Carolina Sales Center, this fun activity will be a great way to meet others in your community while creating a keepsake for all your precious memories. This event is limited to 20 guests, so don’t wait to RSVP! Contact Hillary Jones at 843-816-6438 or hjones@lakecarolina.com for more details. If there’s one thing we love about Valentine’s Day, it’s all the sweets we get to eat. But instead of buying candy and cupcakes for your loved ones, make them something they’ll cherish...then eat! These red velvet Oreos are easier than you think, and extra delicious! Imagine your world as perfect as can be. Everything is running smoothly. Your children are happy and healthy. You are happy and healthy. Then one day you receive some news that changes the course of your life dramatically. This is the case for one Columbia family and their daughter Eliza O'Neill, a student at Pontiac Elementary, who was diagnosed last summer with a rare genetic disease called Sanfilippo Syndrome. A disease that by the age of 6 causes irreversible brain damage and life expectancy of early teens. Now, imagine that there is an experimental treatment, that has proven successful in curing the disease in laboratory mice! Your child, who is suffering from this disease, is a prime candidate and eligible for this treatment which can potentially save her life! The kicker is, you also need to raise $2.5 MILLION to receive it. Eliza is that perfect candidate and WE as a community can help! On March 1st there will be a 5K Run/Walk held in Lake Carolina where ALL proceeds will go to help Eliza receive this life-saving treatment. Please register at www.strictlyrunning.com and choose "Eliza's 9 Month Miracle 5K" to help raise money for this amazing little girl's quest for her cure. Spread the word about the race and encourage your family, friends, colleagues, and students to register for this race. You can learn more about Eliza, the disease, and her quest for treatment at www.facebook.com/ElizaOStory. Participants paid a $10 donation to charity to take the plunge. Some people formed teams and began fundraising weeks before the event. Gary Matthews’ Polar Bear Brunch raised nearly $2,500 for the event. They collected donations from friends and local businesses. “We love the community we live in and certainly feel blessed to have landed here. It warms our hearts to combine bringing people together to have some fun and helping out the less fortunate children of our area,” said Matthews. Lake Carolina’s Annual Polar Bear Plunge, now in its 10th year, is a favorite among residents & neighbors. Food & beverages were provided by Marco’s Pizza, Famously Frozen & Dunkin Donuts. Children’s Charities of the Midlands is a 501(c)3 organization dedicated to promoting charitable endeavors that are committed to improving the health, welfare and education of South Carolina's youth. 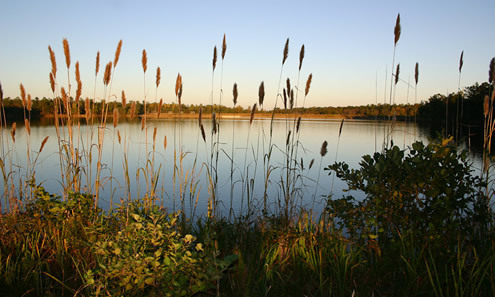 View Lake Carolina’s Event Calendar to see what’s happening next. Find us on Facebook and follow us on Twitter for Event Promotions, Giveaways and Highlights.